Versace Pour Homme by Versace for Men is a sensual aromatic Fougere fragrance that has an aura of masculinity. The enigmatic Eau de Toilette is not only good for parties but also for work and casual outings with your loved ones. Master perfumer Alberto Morillas has perfectly blended lemon, bergamot, neroli, and rose de mai with essences of fresh flowers, green grass, and fragrant, subtle spices. The scent comes in a 100ml flacon with bold cuts. The design is as manly as the scent. Versace Pour Homme by Versace for Men opens with accords of citrusy lemon, fresh neroli, tart bergamot, and intense rose de mai. The aroma radiated by the opening notes is extremely refreshing. The middle notes of the Versace Pour Homme by Versace for Men are focused mainly on floral elements. Intensely fresh hyacinth coalesces with the green notes of clary sage, geranium, and cedar, to give off an aroma that is engaging and mysterious. 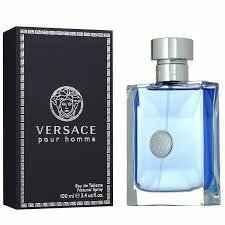 The heart notes of the Versace Pour Homme by Versace for Men are followed by base notes that comprise of almond smelling tonka bean, warm, comforting musk, and amber. These notes support the upper layers of the composition, highlighting them, for a dry down that is nothing short of sophisticated.